One of the joys of living in Battle Creek, Michigan is seeing the history of a bygone area. I love when a historical home has been restored. 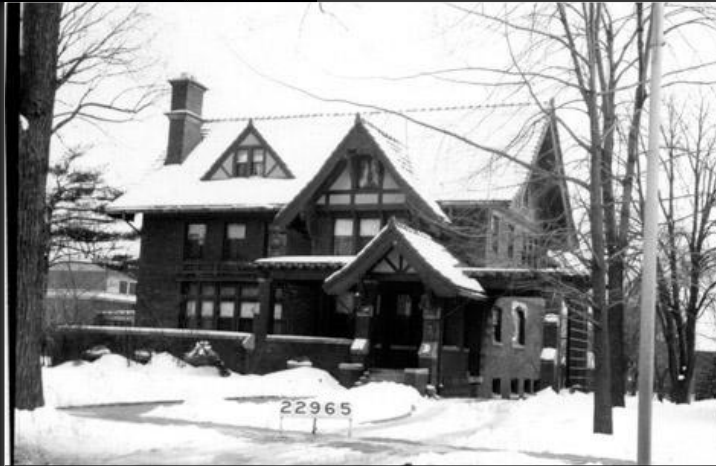 One such home is the Seirn B. Cole Home on Capital Avenue, in Battle Creek. Seirn B. Cole's house is a restored 1912 Arts and Craft Style design. It has a Michigan Historical Marker in front of it. Seirn B. Cole and his wife, Elizabeth nee Farmer, lived here during their time in Battle Creek. Mr. Cole was a contractor and responsible for many of the historical buildings in Battle Creek. His work can be seen at the Battle Creek City Hall, Ralston-Purina Plant, Masonic Temple, and Battle Creek High School (Check back for posts on these historic buildings), all wonderful structures still standing in Battle Creek. Seirn B. Cole retired in 1934 but his vision lives on in the Cereal City. My husband and I will be having a very low key Thanksgiving this year. We have turned down all invitations to celebrate with family and friends and I have decided not to host it at my house this year. This is the year our children celebrate Thanksgiving with their in law's family. I guess I am being the 'turkey' or 'Thanksgiving Scrooge' this year. I love to cook and Thanksgiving is one of those holidays where I can go all out. But, this year I am not even cooking a turkey. I bought a stuffed turkey breast, gasp!, and plan to have a vegetable and bake one pie. This is so unlike me. I feel a little guilty about it. We have had an unusually hectic fall and we feel we need the down time to finish a few projects and start getting ready for Christmas. Look out kids, Christmas should be spectacular! I hope everyone has a very Happy Thanksgiving. My paternal grandmother, Sarah Lilla Watt, was married twice. First, to my grandfather, Harry Glover; and second, to Ray Bell. 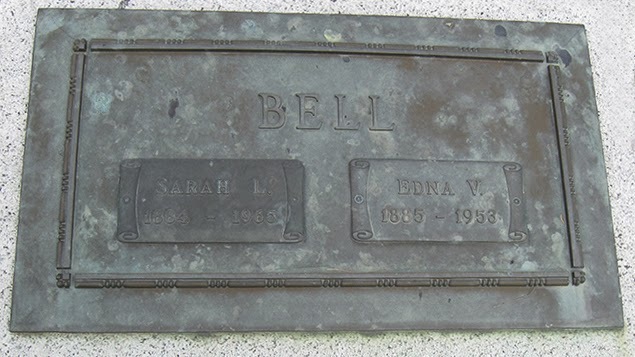 Ray Bell had been married previously to Edna V., the Edna on the above gravestone. Ray Bell buried his two wives in the same plot in Queens Park Cemetery, Calgary, Alberta, Canada. 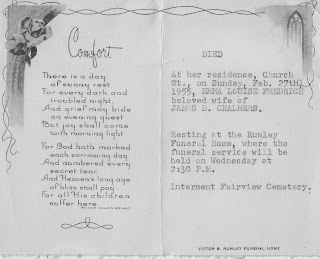 I don't know whose idea this was, but I know that my grandmother had a cemetery plot next to her first husband in Park Cemetery, Marquette, Michigan, which my father thought would be her final resting place. I would guess that the logistics of transporting her body out of the country was more difficult than the Bell family wanted to deal with. I have never been to Calgary to visit my grandmother's gravesite, but a wonderful volunteer on Find-a-Grave sent me the pictures. I have to admit I was a bit shocked when I saw the two wives sharing a tombstone. I wrote about my feelings here. I have been thinking a lot about my grandmother lately. Her birthday was 23 November, this past Saturday. Happy Birthday and Rest in Peace, Grandma Bell. Church records are some of the best sources for genealogists. I love when I find online church records because traveling to all of the locations my ancestors lived in is unrealistic. I have contacted churches by mail or email, but when I find records online it saves me time and money. The New York Genealogical and Biographical Society was present at the recent FGS conference in Fort Wayne, Indiana. One of the freebies offered at their table was a copy of their Summer 2013 publication, The New York Researcher. Jim Paprocki authored an article on page 34, Rochester Churches Indexing Project Online. 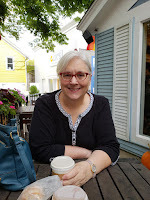 This article talked about the free searchable database at www.rcip.info for Rochester Churches, Monroe County, New York. I have a few ancestors with ties to Rochester so I put this on my to do list to check out. The Indexing Project was started by volunteers with the Rochester Genealogical Society. They even have a facebook page, Rochester Churches. The project has almost 30,000 marriages and 14,000 baptisms in its' database. Searching the database is simple. One can search by surname or by a specific church, or by the bride or groom's name. Other features include the ability to leave messages or make corrections to the index. A variety of information useful to genealogists is found on this website. Currently, a list of 33 churches is listed on the website. The churches included in the database as well as the dates covered can be found here. Although the database is not a primary source, it is a valuable resource that will start you in the right direction and lead you to the original documents. If you have Rochester, New York ancestors this may be a great resource for you. 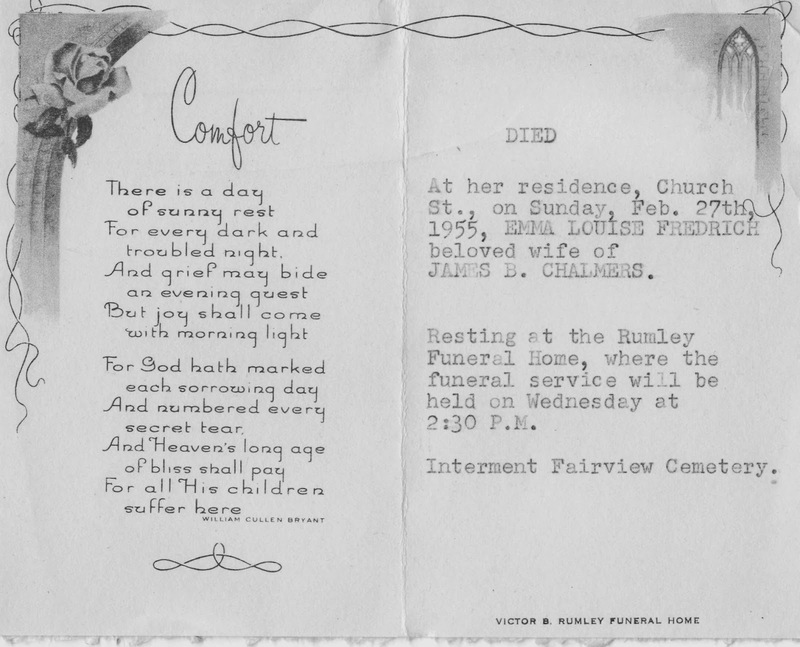 Church St., Rumley Funeral Home, and Fairview Cemetery are all located in Acton, Ontario, Canada. Emma Louise Fredrich is the daughter of J. August Fredrich and Louise Zastrow on 13 July 1876 in Manistee County, Michigan. She married James B. Chalmers 6 June 1905 in Toronto, York, Ontario, Canada. "Billy" and "Lady" are the names given these two pet goats by admiring Ray Fredericks, age 13, son of Mr. and Mrs. Otto Fredericks of Brethren. Although the goats are the property of the Adamczak farm next door, Ray has practically "adopted' them as his own. The above clipping was found in the Manistee News Advocate, Manistee, Michigan on 9 April 1946 at the Manistee Public Library in Manistee, Michigan. Ray Fredricks is my mother's brother, my uncle. Standing Fourth from Left- My grandmother, Sarah Lilla Glover. My grandmother, Sarah Lilla Watt Glover Bell, never liked the thought of her son, Bruce, and stepson, Francis "Hank" going off to war. As a mother of a son, I didn't like it when my son had to sign up for selective service at the age of 18 and he didn't go to war. I can't imagine how she felt seeing her son report for duty the day after his high school graduation. The Mom's of America chapter was a source of support for her. It was a group of mom's, all of whom had son's fighting in World War II. The picture above was in a photo album at my parent's house. I don't have a lot of information on it and I can only identify my grandmother. My grandmother was living in Hazel Park, Michigan at the time. I don't know if the chapter was a Hazel Park one or an Oakland County one. I tried cropping and enlarging the certificate in the picture, but I can only make out "Mom's of America" and "Chapter". I posted the picture on the Hazel Park Historical Commission Facebook page and hope someone can identify others in the picture. As we celebrate Veteran's Day today, I thought celebrating mom's was important too. Thank you to all those who have served or are serving in the military AND their families for the numerous sacrifices made to protect our freedoms. 20 November 2013 Update: Facebook Groups are awesome! I posted the above picture on the Hazel Park Historical Commission Facebook page on November 11th and by the 18th everyone was identified. Richard Robbins of the Historical Commission found a newspaper article in their archives, which included this picture. I only had an 8 x 10 copy of the picture. I never realized it was published in the Hazel Park Palladium newspaper. 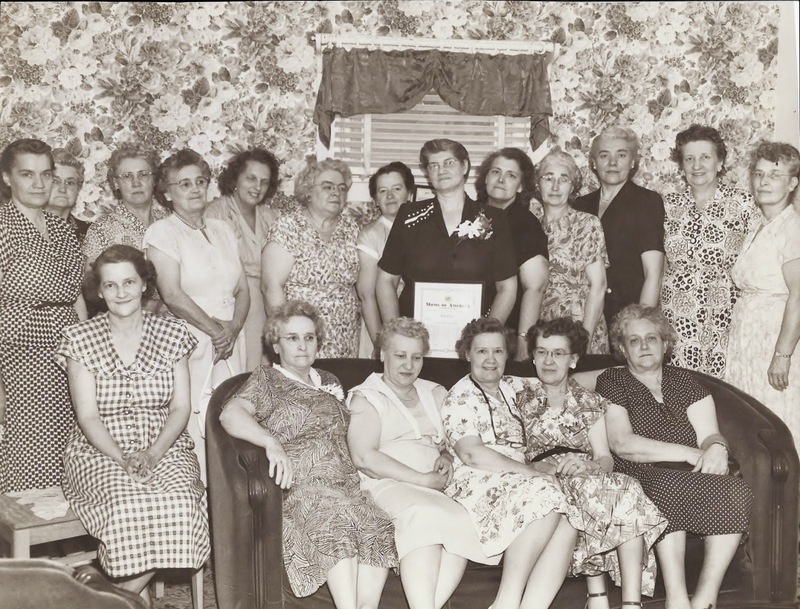 This MOMS Group was Chapter 17 and chartered 18 June 1942 and disbanded in 1990. The Hazel Park MOMS club held its installation on June 18. The State president of the club was the installing officer. The new officers present were, standing, left to right: E. Garlinghouse, E. Langton, M. Armour, S. Glover, Mrs A. R. Knoblock, Mrs. H. Beecher, director; Mrs. Renfrew, Mrs. S. Abromski, president; Mrs W. Gibson, director; Mrs. C. Bemus, treasurer, Marie Fedorchuk, Mrs. V.F. Jones, State president and installing officer. 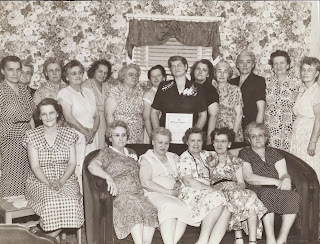 Sitting, left to right, are: Mrs. George McArdell, Mrs W. Webster, historian, Mrs. F. Connolly, financial secretary; Mrs L Knoblock, vice president; Mrs. Jess Landon national financial secretary; Mrs. R. S. Shannon, recording secretary; and Mrs P. West, corresponding secretary. Photo by William T. Dennis.